Please come in and have a look around. You’ll see pictures of some of my favourite pieces (the ones that I can’t bring myself to part with......yet) and a host of other points, blades and knives that I offer for sale. 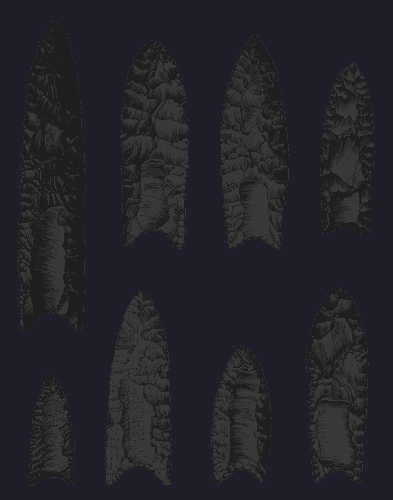 In addition, there is a reduction sequence that shows the manufacture of a Thebes point, in several stages, with some explanation as to the process and the tools used. Also shown are a few examples of some of the types of stone used by prehistoric people here in Ontario, Canada. 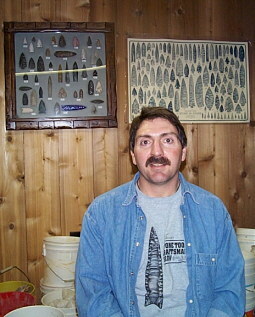 I started flint knapping in 1990, working the local Onondaga chert that was so well used here in Southern Ontario during prehistoric times. Although it’s still one of the rocks I most like to work with, I have since tapped into the wealth of other lithic materials available from sources primarily in the US. My main interest is in replicating North American point types, using traditional tools and techniques. I use moose antler and copper to flake and shape pieces from their natural forms (spalls, chunks, nodules, etc.) into useful and artistic tools. Like many knappers I try to learn something from most every other knapper I meet, but much of what I know I learned from my mentor, Ken Wallace of Castile, N.Y. Flint knapping looks easy when you see a master doing it, but it takes (in most cases) several years of dedication, a lot of rock, and if you’re fortunate, the guidance of a great teacher. All of the pieces I make are signed and dated. If you’re interested in a specific point type or material, and you don’t see it here, let me know, I might be able to make it for you.